Sunday morning, the wedding had been a success and it was time to head back south. I had visions of Lexington bbq glory for lunch and the opening Sunday games of the NFL season for when I made it to Charlotte. Sadly, it wasn’t until I had crossed the North Carolina state line that I came to the shocking realization: Honey Monks or Lexington #1 was closed on Sunday. 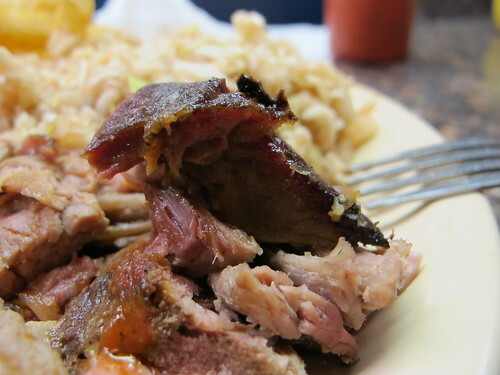 In fact, every Lexington bbq outpost was closed on Sunday, all save Smiley’s Lexington BBQ. After pulling into Lexington and parking in the front, I was soon seated with a large chopped half brown bbq tray in front of me. 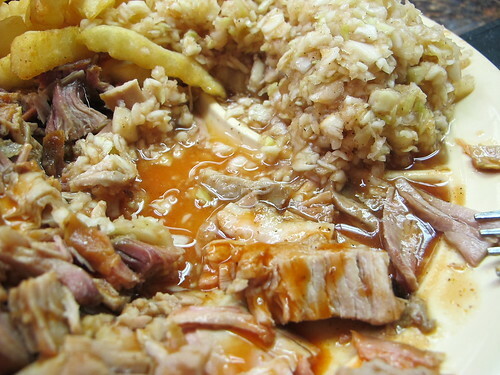 Coarsely chopped and swimming in sauce, this silky pork had a big hickory flavor with each bite. You can get a good idea of just how much bark you get with a half brown order. One thing that surprised me was the lack of available sauce. 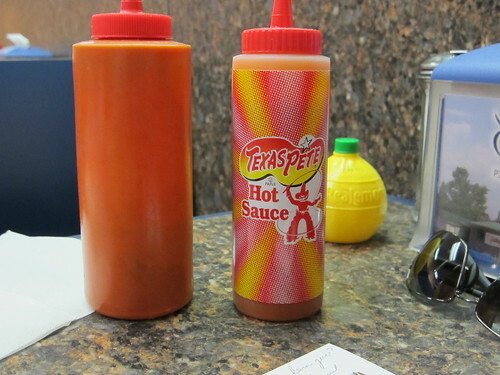 Instead of a bottle of bbq or vinegar based sauce, each table had a bottle of ketchup, Texas Pete hot sauce, and for some reason, a squeeze bottle of lemon juice from concentrate. I’m still not sure about the role of the lemon juice. I was surprised at just how well this bbq worked with liberal applications of Texas Pete. It was a little one dimensional but not bad. 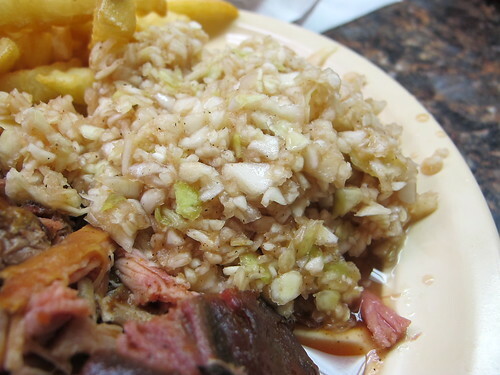 The cole slaw bore a striking resemblance to the slaw at Stamey’s, and the flavor began with a sweet note and ended on vinegar. 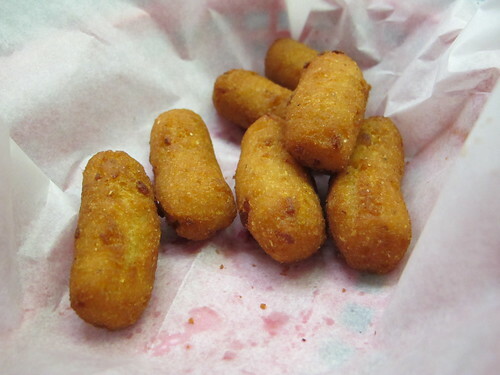 The side of hushpuppies were nothing more than slightly salty, dense, and completely over fried lengths of cornmeal. They were better than the miserable crinkle cut fries but that’s not saying much. While this Smiley’s certainly wasn’t the vinegar laced bbq epiphany that I was hoping for in Lexington, it does gain points for being the only option for Sunday bbq. There’s nothing wrong with Smiley’s bbq, it’s well smoked with a bark to prove it, but there was something missing. I just can’t put my finger on it. 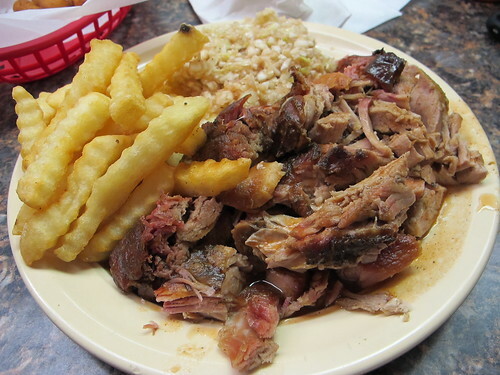 Regardless, Smiley’s Lexington BBQ is a pretty fair choice, especially on a Sunday. One of my favorites in Lexington, though on the whole I find that city underwhelming considering its reputation. Smiley's is the best Lexington BBQ, period. -I really wish I had made it to Honey Monks but I'm with you on Lexington being somewhat underwhelming.